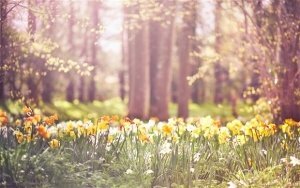 Refresh your property this spring with Electric Heating. Spring has finally arrived and it may only be 13°C, but the locals are out in force at the slightest hint of sunshine in their shorts and t-shirts ready to soak up the British sunshine. It is the perfect time of year to start thinking about taking advantage of our longer days and warmer weather – unless of course you are a cold blooded lizard like a certain Mr Squirrell in our office seems to think that I am, due to my disapprobation for the air-conditioning in our office through-out the winter… but we won’t go into that! Noted, it may not be scorching, but for the next 5 months we can coast along at a comfortably warm temperature. I say comfortable as the hottest recorded UK temperature for 2015 did actually reach a whopping 36.7°C. Spring cleaning has begun, and people are opening their windows and letting the fresh air flow through their homes. The checklist is out and the de-cluttering and deep cleaning has begun. Along with spring cleaning, upgrading vital elements to your home is an aspect to consider. Taking advantage of quieter periods for engineers, tradesmen and indeed suppliers low season sales are certainly worth looking into. Upgrading your heating for a fantastic deal with a premium heating solution, could improve your energy efficiency and reduce heating costs. Our heat loss calculations are able to match the perfect heating solution for customer’s needs. The new range of next generation home domestic heating – the Rointe Delta collection is perfect if you are looking to not only upgrade, but to look at energy efficiency. "Rointe in particular have running costs 60% lower when compared to other types of heating". A healthy heat, which keeps the humidity relative without drying out the environment using the natural convection of the specially designed fins. Reducing the risk of a breakdown in Winter when engineers are at their busiest by being prepared now, seems logical when you think about it.